Impeccable timing is what all great guitarists have in common. It doesn't matter how fast you play, or even so much as what you play... sloppy timing sticks out like a sore thumb, even to the casual listener. Good timing earns you the respect of your fellow band mates, your listeners and a deep feeling of satisfaction as a musician. It's also essential for understanding rhythm and accenting different notes, whether you want to "lock in" to the beat or use a more syncopated groove or swing around it (which we'll look at in later lessons). But many guitarists don't know how to practice the art of timing, especially for lead/soloing. That's where this series of lessons comes in, giving you a solid lead guitar timing method that you can start using immediately, regardless of your skill level. A metronome is an essential tool for any musician serious about improving their timing and building speed. There are now a few ways to get access to a metronome. There's the traditional "tick tock" mechanical metronomes such as the Cherub WSM-330, which has a certain ornamental charm! Then there's the battery operated, digital kind, which offer additional functionality such as tap tempo, click samples and tuner, e.g. the Korg TM50. If you own a smart phone or tablet, you can get metronome apps for your device by searching your app store. And of course, many free online metronomes exist, such as Jamplay and the rather proudly named Best Metronome. I personally stick with the app and online metronome as I like to keep as much on a single device as possible. In the video, we started with 4/4 or "common" time. This is the time signature used in most pop and rock. 1 2 3 4 1 2 3 4 1 2 3 4 1 2 3 4 etc. The strongest beats are 1 and 3. In a basic 4/4 rock beat, the bass drum will be kicked on these beats (although often there will be additional kicks around these beats). 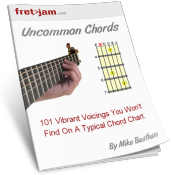 Chord changes and changes between verse and chorus will most often occur on the 1st beat. The weakest beats are 2 and 4. The snare drum tends to be hit on these beats (again, typically with some additional flourishes). Make sure this basic strong/weak beat positioning is firmly in your mind. Counting the beats at first will help to internalise it. As well as a metronome, you should also practice timing your lead to a drum beat. So as promised in the video, below I've provided 4/4 drum tracks at various tempos for you to download. Remember, the bass drum is on beats 1 and 3, snare on 2 and 4. Oops. Your browser doesn't support native audio. Download it above instead. Note values are simply a way of measuring and communicating the duration of notes in a piece of music. In a given solo or riff, we have notes of varying lengths. Some are held through several beats. Others are played in quick succession. By studying note values, you'll become more aware of how notes can be timed to/around a beat, to help you express yourself articulately and intuitively. Remember, we won't always be starting the whole note on the 1st beat. But the length of the note, even if started on the 2nd beat, for example, will always span the same duration. So a whole note starting on the 2nd beat would end just before the 2nd beat of the following measure. A whole started on the 3rd beat would end just before the 3rd beat of the following measure. This is where the second "4" in 4/4 comes in. The first 4 tells us there are four beats in the measure. The second 4 indicates that quarter notes represent the note value of each beat. In other words, four beats, spaced a quarter note apart, make up a measure in 4/4 time. Eighth notes will likely be your most commonly used note value, and when alternate picking becomes beneficial for pick-hand economy. When practicing the note values above, or any scale, lick or riff for that matter, you should first try increments of 10 BPM on the metronome, only increasing the tempo when you can play flawlessly at the current tempo. If you're struggling with 10 BPM jumps, try 5 BPM instead. For example, many find 10 BPM jumps to be fine at lower tempos, but then need to make the increments smaller as they get passed 100 BPM. It's up to you what BPM you start at. I think 60 BPM is a good starting point when 8th notes are the highest note values you'll be using. However, if you're going to be playing 16th notes, try starting at 40 BPM and go from there. By using 5-10 BPM increments, the change will be subtle enough that your fingers and brain won't find the increase too much of a jump, but enough that you'll soon get up to the desired speed. Obviously, 16th notes will be the most challenging at higher tempos. Relish the challenge! You will get there if you have discipline with the metronome and remember to only increase the tempo when you're 100% confident with the current tempo. Once you're confident with differentiating the individual note values, it's time to practice combining them through a sequence of measures. Try the exercises below. Each one spans four measures. It's not so important what you play at this stage, just find a scale pattern, lick or riff to cycle through, ensuring you can transition between the different note values seamlessly and in time to the metronome or drum track. Again, use the 5-10 BPM increment rule to speed up gradually. Of course, you should try and come up with your own timing exercises using the core note values we've learned. In the next part, we'll look at how to make our lead timing more dynamic and interesting, using techniques such as starting and ending "off the beat", giving our lead lines a driving momentum. Until then, thanks for your time and patience!